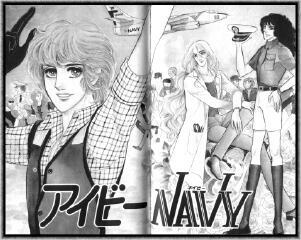 This page describes mangas by Yasuko Aoike other than From Eroica With Love. Thanks to Masae Ueno for providing the information given here. A love story of a sweet girl, Miriam Blue, whose heart vacillates between her unpredictable boyfriend, Henri, and her step-brother Laurie. This is an early example of Aoike's artwork. 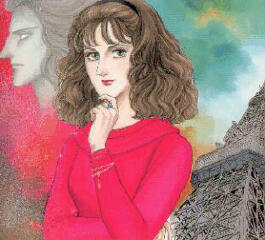 The plot writer for the manga is Keiko Nagita; only the drawings were done by Aoike. Slapstick homosexual comedy. 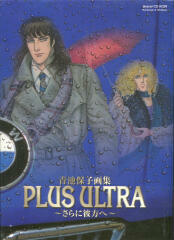 The protagonists are three British men: Justin (a rock singer), Heath (a macho pianist) and Virgil (a hedonistic poet). Heath and Virgil are gay, and they are forever making passes at the androgynous Justin, who complains about it all the time but eventually stays with them because they all belong to the same tribe called "Vin Rose", the descendents of men created from the rib bone of Eve instead of Adam. The story is about the three transported to the weird, crazy world of Vin Rose, which is populated with historical and/or fictitious characters, most of them either gay or lesbian. Of interest to Eroica fans, the side story Good Company features appearances by Major Eberbach and Agent G, showing how an assignment first led Agent G to realize he was gay and a transvestite. In the story Prisoner 69, Mr. James turns up as the manager of Heath, the pianist and composer. Later, Tyrian's mother was married to the Governor of Cornwall; Persimmon is the family name he obtained from this marriage. 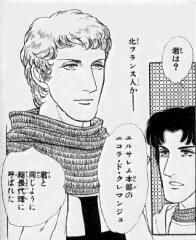 (The Governor's appearance is the prototype of the Chief in Eroica.) The Governor was eventually assassinated on Tyrian's orders. Geraldo Perou, who may have been Tyrian's biological father and was the object of the young boy's admiration, had Spanish blood in his veins. He was an officer in the British navy and a spy for Spain. When Perou's identity was revealed, it was the boy Tyrian who helped him escape from gendarmes' pursuit and flee to Spain. A later encounter, however, when Tyrian was an adult and himself a naval officer, resulted in his having Perou executed by hanging. Tyrian was promoted to a Captain of British Navy in 1584 at the age of 22, then betrayed England in favor of Spain and died in August 1588 in the battle off the coast of Calais, in his beloved ship El Alcon as part of the Armada. He was fatally stabbed by Dorian's ancestor, Luminous Red Benedict, then Tyrian and his crewman Nicholas Jade (who may have been his lover -- Tyrian was actively bisexual) died together in the explosion of the ship. 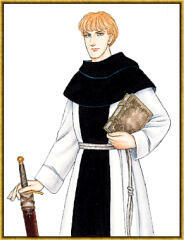 Luminous Red Benedict was a wealthy merchant's only son and a law student at Oxford with a bright future ahead of him. Tyrian's dark conspiracy destroyed the family; Benedict's father was arrested and executed on a false charge, his mother died of grief and their entire property was confiscated or plundered. 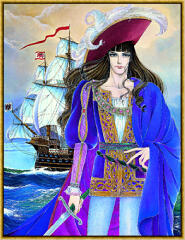 Benedict became a captain of pirates to retaliate upon Tyrian Persimmon. Seven Seas, Seven Skies is the story of the conflict between Tyrian and Benedict, ending with the final battle between them and Tyrian's death. 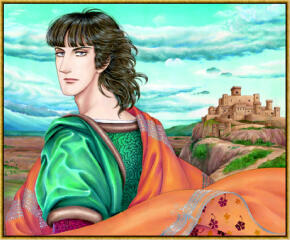 El Alcon, published later, is in the nature of a prequel, covering the earlier life of Tyrian in more depth. 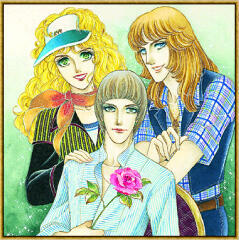 Included in From Eroica With Love tankoubon vol. 2. Slapstick comedy, a lineal descendent of Sons of Eve. A boy, whose name is Tom Cat, is a goodwill ambassador of the West German Ministry of Education dispatched to an oil rich, small island country called "Ivy". He goes on navy maneuvers on the aircraft carrier Tinkerbell for one month. 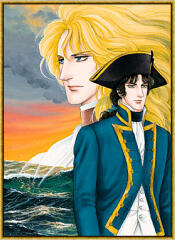 His companion on the carrier is Orion, a navy officer who somewhat resembles a brunet version of Dorian. Another of the crew is the mad doctor, always searching for victims of his surgical skill and therefore the most feared man on the ship. 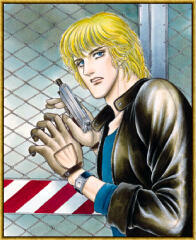 (He has blonde hair about four feet long, and wanders around carrying a skull and dangling a scalpel from his lips.) While Tom is on board, Tinkerbell nips an international dispute in the bud, encounters a big typhoon, and so forth. The British navy officer Eugene Ladric fights in the Battle of Trafalgar to witness his childhood friend Marceau shoot and kill Admiral Nelson. The adventures of Agent Z, the newest recruit to Major Eberbach's alphabet soup of subordinates. These stories take place in the Eroica universe, but they are serious espionage adventure tales and Dorian and his crew do not appear. A hardboiled espionage action story featuring Major Eberbach. Can he elude the pursuit of the genius assassin from the KGB? The unfinished biography of a Castillian king Don Pedro I (14th century). 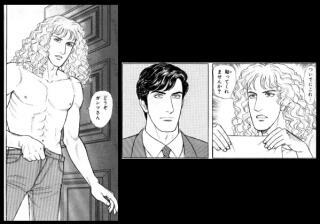 Included in From Eroica With Love tankoubon vol. 15. 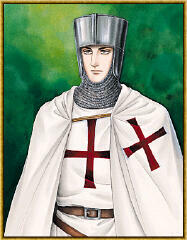 The story of three crusaders at Jerusalem in the end of 12th century; two knights Templar and one knight of St. John. Sequel to The Day of Saladin. 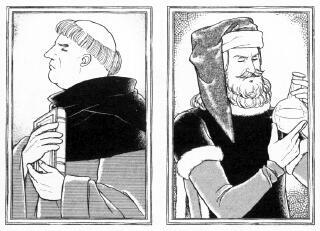 The life and adventures of a handsome young Cistercian monk called Falco in a German monastery, 14th century, with an appearance by Don Pedro in the first episode. Very charming four stories. One of the few Aoike stories set in Tokyo with all Japanese characters. The pretty occult doctor Anri (a young female) has a guardian being called "Ushiro". 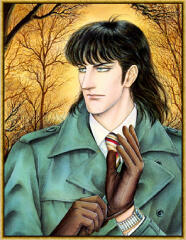 A handsome physician, Dr. Kaga, tries hard to show Anri up as a quack, but is attracted to her at the same time. An occult comedy. 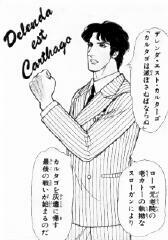 Two British archeologists and a flamboyant Italian viscount are after the vestiges of Carthage. A spy of Queen Elizabeth obtains a letter from Marie Stuart which approves the Babington plot to assassinate the Queen. Two men (who closely resemble Klaus and Dorian) work together to reveal the outrageous falsification of the history of a German town, Hammelburg, which took place eight hundred years ago. Yasuko Aoike Illustration Collection, an art book of Aoike's work. 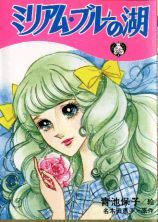 Contains numerous images from Eroica, plus chapters devoted to several of her other mangas. Comes with a CD-ROM. 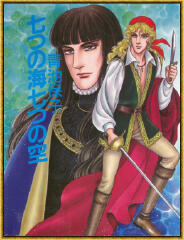 A collection of Aoike characters from Eroica, Sons of Eve, Alcasar, Falco, etc. 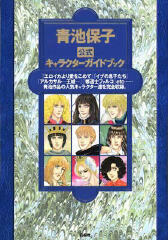 The manga exclusively written for the character book and a long interview with Ms. Aoike are included.